An article based on a tribute delivered by Dr E. Wyn James at the funeral of Dr Ceinwen H. Thomas at Thornhill Crematorium, Cardiff, 7 February 2008. It was translated into English by Rhodri Jones. An earlier version was published inDawns, the journal of the Welsh National Folk Dance Society, in 2008. It would be difficult to begin any tribute to Dr Ceinwen Hannah Thomas without mentioning the word ‘Nantgarw’. Although she lived in Whitchurch, Cardiff, among other places, for much of her life, you would not be long in her company before being told that she came originally from Nantgarw and that, although that village is situated only seven miles to the north of central Cardiff, she was only the second generation of her family to be able to speak English. Dr Ceinwen came from a family which had its roots deep in the lower reaches of the Taff Valley, and she lived in Nantgarw until she had completed her studies at University College, Cardiff in 1937. She attended the infant school at Nantgarw, and then the junior and secondary schools at Caerffili. She always complained bitterly of the anglicised nature of her education prior to reaching the secondary school. For example, although her junior school in Caerffili was near Tonyfelin Welsh Baptist Chapel, none of the teachers ever referred to the fact that the famous preacher, Christmas Evans, had been a minister there and had his home near the school. Even the massive Caerffili Castle was never mentioned in history lessons at the junior school; the focus of such lessons was, rather, on the likes of Walter Raleigh and Francis Drake. The secondary school was more enlightened: a fair amount of Welsh history was taught as part of the curriculum, there was a branch of Urdd Gobaith Cymru (the Welsh League of Youth) in the school, and a number of the teachers spoke Welsh naturally both to each other and to the Welsh-speakers among the pupils. Whilst a student at Cardiff, Ceinwen Thomas gained a first-class honours degree in Welsh and then went on to gain an MA in 1936 (and then a Doctorate from the University of Ireland in 1940) – a rare educational achievement for a man, let alone a woman, in those days. Although Ceinwen Thomas left Nantgarw in 1937, it can be said that the whole of her very full and long life revolved around that village and the Welsh language. With her mother, Mrs Margretta Thomas – another remarkable woman – Dr Ceinwen made an extremely important contribution in recording the Welsh-language folk culture of Nantgarw and its environs. One example of their work was the transcribing of the Nantgarw Dances, dances that are by now such an important part of the folk dance scene in Wales. Indeed, it would not be too much to assert that Dr Ceinwen Thomas and her mother have set Nantgarw – alongside D. J. Williams’s Rhydcymerau, say, or O. M. Edwards’s Llanuwchllyn – in that pantheon of villages which have come to be regarded as the embodiment of Welsh folk culture at its best. In 1993 the University of Wales Press published her detailed description of the Welsh dialect of Nantgarw in two voluminous tomes. This was her magnum opus, the culmination of many years’ study of the phonetics and grammar of Welsh (and especially the language of south-east Wales). 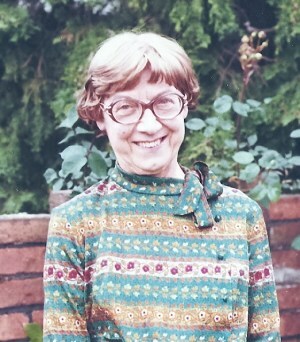 In the 1960s and the 1970s she directed the newly-established Language Research Unit in the Welsh Department at University College, Cardiff. Due to the fact that the number of speakers of the ‘Wenhwyseg’ – the Welsh spoken in south-east Wales – was diminishing significantly by that time, the Unit gave its study special attention, and Dr Ceinwen Thomas’s period there witnessed a flood of theses by the Unit’s research students describing the Welsh dialects of various parts of south-east Wales, a corpus which forms a notable contribution to the study of the Welsh language. However, this academic work in Welsh linguistics was a second career for Dr Ceinwen Thomas. During the twenty years between leaving University College, Cardiff in 1937 and her return in 1958, she was a Welsh teacher in Pen-y-cae (Ebbw Vale) and then in Bryn-mawr. She joined the newly-established Plaid Cymru as a student in Cardiff and remained an unflinching nationalist throughout her life. The 1940s and the 1950s proved to be battlefield years in her history: battling to promote the principles of Plaid Cymru; over interpreting the history of Wales from a Welsh standpoint rather than from that of English imperialism; over the place of Welsh in the world of education; and for the recognition of Monmouthshire as an intrinsic part of Wales. These were years of being at the front line in a time and at a place where things were very hard for the language and the national movement – but she lived long enough to see Plaid Cymru become a part of the government in the Senedd; the emergence of a generation of younger historians who interpret the history of Wales with a far greater Welsh flavour; a tremendous growth in Welsh-medium education; and the death of that hardy chestnut, ‘Wales and Monmouthshire’. One aspect of the Nantgarw life of her childhood against which Dr Ceinwen Thomas turned her back for many years was the world of the ‘tŷ cwrdd’ (the meeting house/chapel). According to her own attestation she was quite agnostic in her response to Christianity for a long time. Then, fairly soon after her retirement, she ventured one Sunday morning to one of the services of the newly-formed Welsh Evangelical Church in Cardiff. She was reminded at the meetings of that church of the warm atmosphere and the similar theological emphasis of the ‘tŷ cwrdd’ where she was raised in Nantgarw. After a period of time she came to profess anew the Christian faith. She did not do so in an unthinking or sentimental way. Dr Ceinwen was not like that! Rather, she weighed up with great seriousness the words coming from the pulpit and re-assessed her situation and creed in the light of what she had heard. The result was that, towards the end of her life, she returned to the faith of her mother and of her forbears in Nantgarw. I fyw tragwyddol o’s. Eternal life not loss. This entry was posted in Tribute on 09/02/2009 by admin.